During 2019, Freedoms Foundation and the Friends of the Medal of Honor Grove are paying tribute to the living recipients of the Medal of Honor on the anniversary of the actions for which they earned the nation’s highest award for valor. The series continues with a look at April 4, 1970, and the actions of Sergeant First Class Gary Littrell, an adviser to the 23rd South Vietnamese Ranger Battalion in Kontum Province. “For conspicuous gallantry and intrepidity in action at the risk of his life above and beyond the call of duty. Sfc. Littrell, U.S. Military Assistance Command, Vietnam, Advisory Team 21, distinguished himself while serving as a Light Weapons Infantry Advisor with the 23d Battalion, 2d Ranger Group, Republic of Vietnam Army, near Dak Seang. “After establishing a defensive perimeter on a hill on April 4, the battalion was subjected to an intense enemy mortar attack which killed the Vietnamese commander, 1 advisor, and seriously wounded all the advisors except Sfc. Littrell. 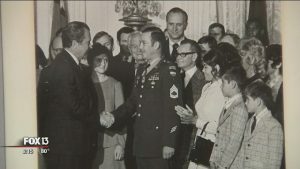 During the ensuing 4 days, Sfc Littrell exhibited near superhuman endurance as he single-handedly bolstered the besieged battalion. “Repeatedly abandoning positions of relative safety, he directed artillery and air support by day and marked the unit’s location by night, despite the heavy, concentrated enemy fire. His dauntless will instilled in the men of the 23d Battalion a deep desire to resist. Assault after assault was repulsed as the battalion responded to the extraordinary leadership and personal example exhibited by Sfc. Littrell as he continuously moved to those points most seriously threatened by the enemy, redistributed ammunition, strengthened faltering defenses, cared for the wounded and shouted encouragement to the Vietnamese in their own language. “When the beleaguered battalion was finally ordered to withdraw, numerous ambushes were encountered. Sfc. Littrell repeatedly prevented widespread disorder by directing air strikes to within 50 meters of their position. Through his indomitable courage and complete disregard for his safety, he averted excessive loss of life and injury to the members of the battalion. 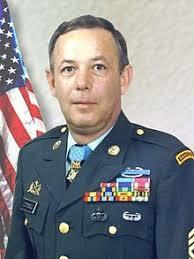 Gary Littrell is honored in the Kentucky (above) and California Areas of the Medal of Honor Grove. “Of the South Vietnamese Rangers who had begun the battle, 41 walking wounded came out — but the enemy [force of about 5,000 North Vietnamese troops] had been virtually annihilated. “Littrell was ordered home a few months later. At his going-away party, his commanding officer told him that he had been recommended for the Medal of Honor, but nothing happened and he soon forgot about it. Three and a half years later, he was serving with the 101st Division when he was informed that he was to receive the medal. President Richard Nixon made the presentation at the White House on Oct. 15, 1973.